The Cancer Association of South Africa (CANSA) partnered with the Vodacom Blue Bulls for a Get Your Pink On game against the Toyota Cheetahs on 2 April 2016. The Bulls were not the only winners that night, when they beat the Cheetahs 23-18, but CANSA also came out tops with over R600 000 raised during this campaign. 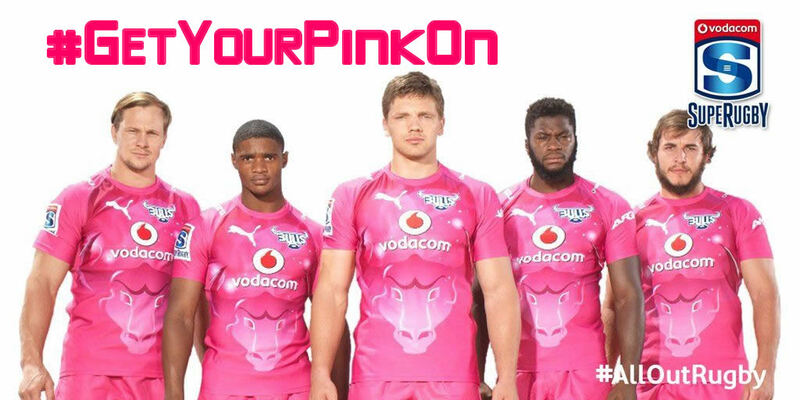 The Blue Bulls wore a special edition pink kit on game day, and encouraged all spectators to wear prink to show their support. “We feel that once again, the Get Your Pink On campaign was a huge success. Not only did we manage to raise a substantial amount of money, but we also got the opportunity to educate the public on the importance of cancer and health awareness, as well as conduct some screening with the help of our CANSA Mobile Health Clinic. We’re grateful to every CANSA, Bulls and Cheetahs supporter who made sure to let their pink show on game day,” says CANSA CEO Elize Joubert. The money raised will be used to buy another CANSA Mobile Health Clinic (bringing the total to 10) so that CANSA can conduct cancer and health screening in the local communities. This specific Mobile Health Clinic will be used in the following areas; Hammanskraal, Winterveld, Hebron, Soshanguve, Mapone and Garankuwa. Read more on what CANSA’s Mobile Health Clinics offer. “Thank you to Vodacom and the Bulls who allowed CANSA the opportunity to be a part of this campaign once again. We know that one in four people in SA are affected by cancer, and we are glad that these people are standing together to fight against this dreaded disease,” continues Joubert.